In this tutorial, we'll explore how to record screencasts in Storyline. To actually insert a screen recording into your story, check out this tutorial. 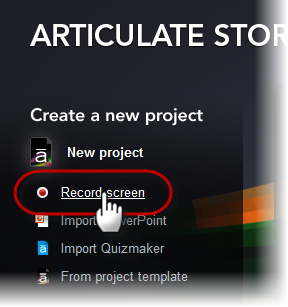 When you first launch Storyline and you are looking at the welcome screen, you can click the Record Screen option to begin a new project by recording your screen. If you're working in an existing project, the quickest way to start a screen recording, when you’re in Story View, is to click the Record Screen button on the Home tab. Or, when you’re in Normal View, click the Record Screen button on the Insert tab. Tip: The drop-down arrow on the lower portion of the Record Screen button is used to add an existing screen recording to your story. To start a new recording, click the top portion of the Record Screen button. Go to the Home tab, and click New Slide. Go to the Insert tab, and click New Slide. In Story View, you can also right-click anywhere in the workspace, and select New Slide. In Normal View, you can also right-click anywhere in the left navigation panel, and select New Slide. When the Insert Slides dialog appears, select the Screen Recordings tab. The Storyline window will disappear, and the screen recorder will launch (but it won't start recording right away). When the screen recorder appears, the first thing you will want to do is click the gear icon on the recorder control bar to select your recording options. Use the following fields to assign keyboard shortcuts that you can use to stop or pause/resume your recording, or to take a screenshot. Place your cursor in each field and press the desired key. The field will update accordingly, depending on the key you press. 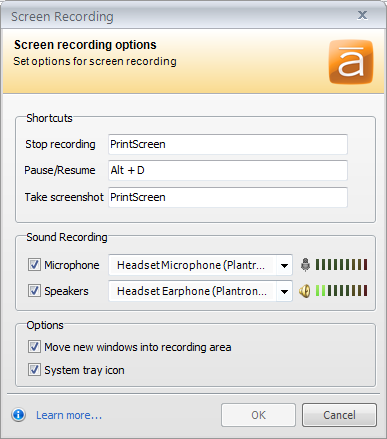 Microphone: If you want to record audio from your microphone during your screencast, select the Microphone checkbox. (Make sure your microphone is plugged in and ready to go.) Then use the Microphone drop-down list to select the microphone you want to use for recording. Speakers: Select the Speakers checkbox if you want to record system sounds, and use the Speakers drop-down list to select your desired playback device. Note: If you choose to insert your screen recording as step-by-step slides, any audio that you record with the screencast will not be used. Step-by-step slides display only the action-related clips of your original screencast. As a result, the recorded audio would not match up to the individual slides if it were included. Your audio will still be available in your original screen recording in case you also want to insert it as a video on a single slide. Move new windows into recording area: If you will be recording a software demonstration or a program that includes multiple windows, you may want to select this checkbox to ensure that each window is properly captured within the recording area. System tray icon: Select this checkbox if you want a Storyline icon to be displayed in your system tray while you are recording. If you need to record your system tray and you would prefer not to see the Storyline icon in your screencast, deselect this checkbox. Tip: If you choose to display the Storyline icon in your system tray, you can simply double-click it when you have finished recording in order to stop the recording process and close the recording window. Then you will be presented with options for naming, previewing, and inserting the recording into your story. Click the OK button to save your screen recording options. Resize the dashed outline of the recording area by dragging the sizing handles on the dashed outline, or use the drop-down list on the recording control bar to select preset dimensions, or choose the Select a window option to select a specific application that is currently running. 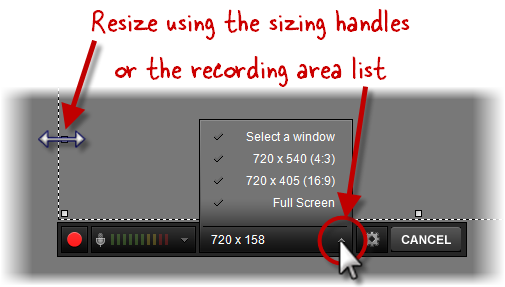 To optimize your screencast so it fills the entire slide, make the size of your recording area match your slide size. The largest screen recording size that is supported is 2046 by 2046 pixels. Multi-monitor recording is not supported. If you will be recording a web application or web page, you may use the browser of your choice. However, be aware that Internet Explorer is the best option, because it provides the richest set of data to the Windows Accessibility API, which is how Storyline collects information about your screen recording. Firefox also works very well. Google Chrome, unfortunately, reports very little information, so details will be missing from your captions and some steps could be omitted as well. Reposition the recording area by hovering over the dashed outline or over the gray How to record box in the center of the recording window. A four-headed arrow will appear, and you can drag the recording area to the appropriate location. You can also use the microphone drop-down list to change your audio recording device, or select No Audio if you do not want to record audio with your screencast. Click the red Record button on the recording control bar. If you need to pause the recording, you can use the Pause / Resume keyboard shortcut you specified earlier, or you can click the Pause button on the recording control bar. To resume recording, use your Pause / Resume keyboard shortcut again, or click the Record button on the recording control bar. If you make a mistake or wish to start over, click the trash can icon on the recording control bar to discard your current recording. Then you can click the red Record button again to start over. To exit without recording, click the Cancel button on the recording control bar. When you have finished recording, you can click the Stop Recording keyboard shortcut you specified earlier, or you can click the Done button on the recording control bar. When you have completed your screen recording, you will have the option to change the default name of your recording, so that you can easily identify it later. Type a name for your recording in the Name field that appears above the recording. Before you actually insert the recording into your story, you can preview it by clicking the Play / Pause button in the lower left corner, or use the seekbar to jump to a specific point in the recording. If you change your mind and want to discard the screencast, click the Cancel button in the lower right corner of the screen or press the Esc key on your keyboard. You'll be asked if you want to save the screencast for later use. Depending on the purpose of your screen recording, you can choose to insert it as a Video on a single slide or as a series of Step-by-step slides—or both. To learn more about inserting screen recordings into your story, click here.